Fidget spinners have become one of the most popular new toys, specifically for students. 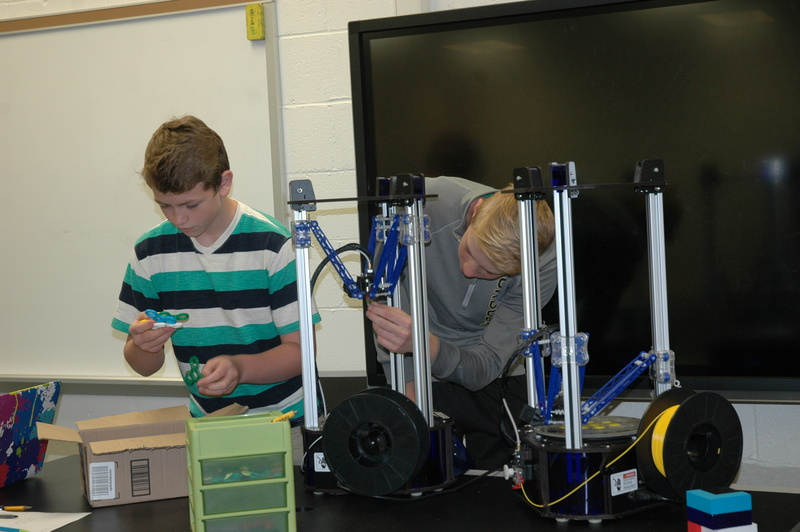 Pictured are Austin Myers, left, and Grant Brooks working with the fidget spinners on the 3-D printers. These students have not only used the popularity of these devices to create a business venture which has already raised enough money to buy the school a third 3-D printer, but they have also begun to learn all the components of the 3-D printers. They know how to program them and set them up on top of being able to notice when an error is occurring and it needs to be restarted. MILFORD—Two seventh-grade boys from Milford Middle School, Grant Brooks and Austin Myers, have become quite popular among the student body with their new business venture. The boys had found the fidget spinners, a new craze among students, online and brought one to their robotics teacher, Kim McCreary. They asked if they would be able to make using the 3-D printers and McCreary told them it would probably work, but they would need a reason. That’s when Brooks and Myers decided they could sell them to fellow students and use the money to buy another 3-D printer for the school. 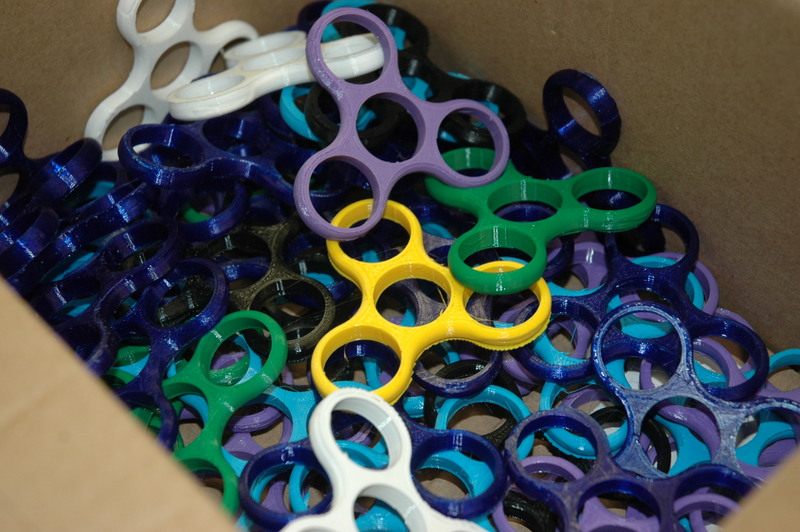 Students are able to order their fidget spinner in any of the available colors and, once it is completed and paid for, they get to choose their cap colors as well. The boys only charge $5 per spinner and the money goes directly back into the school. Once the fidget spinner has been completed on the 3-D printer, they are taken off and the bearings are hammered in. One of the more tedious parts is having to peel off the rough, bottom edges and smooth out the spinner. Brooks and Myers have also learned the hard way if a bearing is pounded in too hard, the spinner will break. However, they had no idea their business idea would take off like this. A list of the names of students with finished fidget spinners are given to the office and read in the morning announcements. A box of finished fidget spinners sit waiting. Unfortunately the Brooks and Myers are having to wait for the ordered bearings to arrive to complete these orders. As of Monday, May 15, there have been 243 total orders placed and they had made a total profit of $583.58. However, that profit will decrease dramatically since last Friday they had met their initial goal and McCreary was able to order their brand new 3-D printer. McCreary has remained impressed with the company based in Goshen, SeeMeCNC. They have helped with everything from repairing circuit board problems to sending necessary replacement parts. She is also impressed by the online curriculum J.J. Johnson, engineering and tech support as well as a former educator, placed on their website to help teachers utilize the 3-D printers in their classrooms. According to McCreary, these 3-D printers are used among all grade levels at Milford School for various projects from robotics to problem-solving to creating animals in shoebox habitats. With the school year coming to a close, Brooks and Myers have been working with McCreary to keep the 3-D printers running the entire day. This includes coming in between classes to take off the completed project and restart the printer. They plan to take a break during the summer months and start again when school begins in the fall. The fact they have already met their goal has not stopped them, though. They are now looking at getting a fourth and larger 3-D printer which will involve raising even more money. 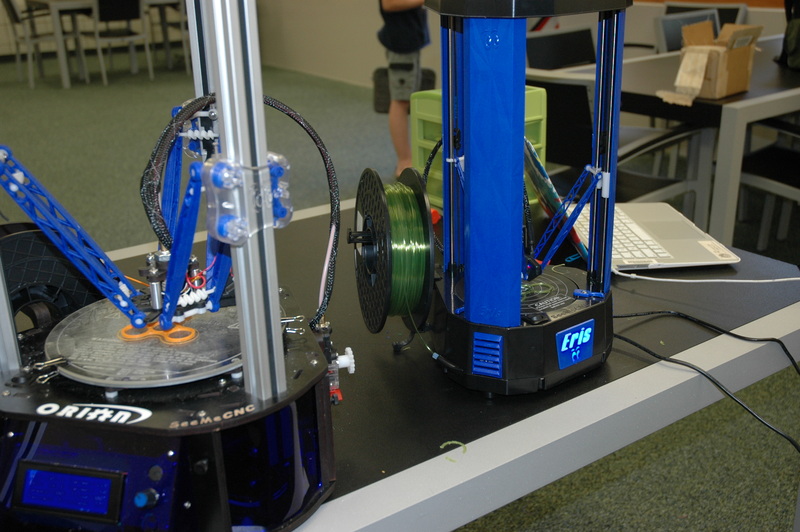 The brand new 3-D printer arrived Monday, May 15, and McCreary had it up and running by Tuesday morning. 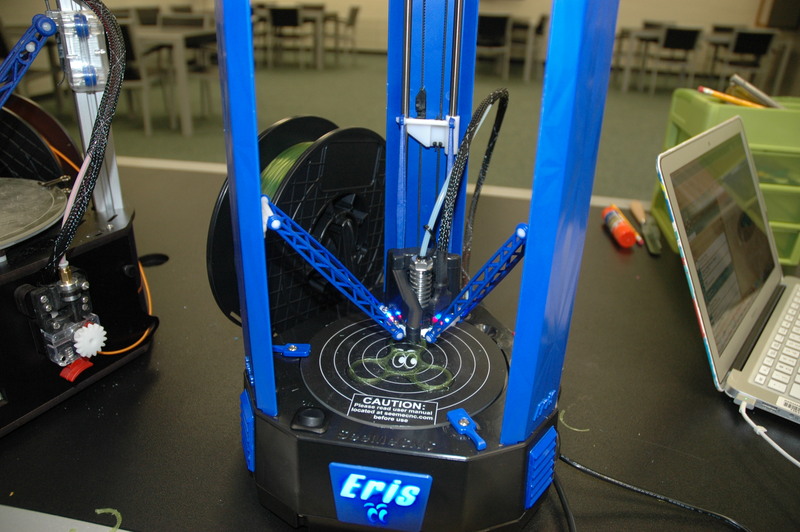 It has a better filament feeding system, upgraded plate with a better fastening system and lights on the bottom. The old and new 3-D printers work side by side with all three making batches of fidget spinners. The boys not only bought the new 3-D printer but also two new colors—orange and translucent green. 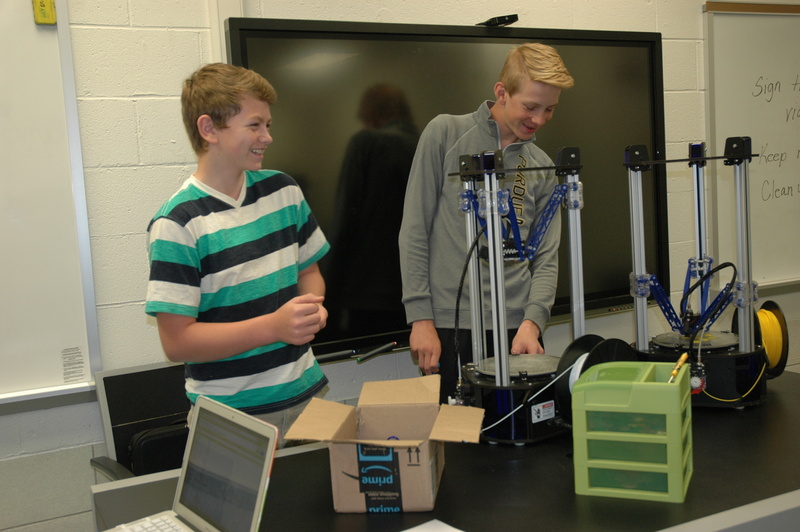 Austin Myers and Grant Brooks continue to have fun working with the 3-D printers and thinking up ways to make their business even more successful. 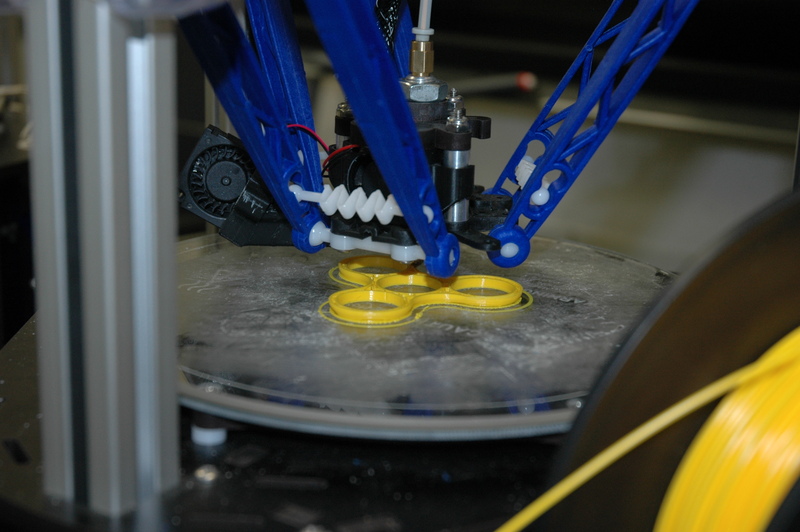 One of the two 3-D printers at Milford Middle School works on a fidget spinner.